Microsoft has confirmed a widespread outage has hit its mail services across a range of different Windows platforms. In a bulletin issued early this morning, Microsoft confirmed that Windows 8 and 8.1 Metro Mail, Windows Live Mail and mail on Windows Phone 8.1 have all been experiencing problems and the issues are continuing to hit users even now. "We are aware that users of the following mail clients are experiencing issues syncing and sending email. We are working on the issue and expect resolution in the next 24 hours. - Windows Live Mail - Outlook Connector - MSN Premium client. 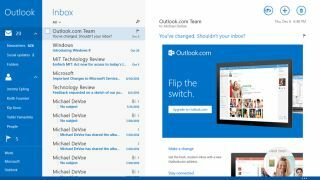 - Windows Phone 8.1 - Windows 8 Mail Client," read the update released at 12:34 PST. The problem restricts syncing and sending of emails through the programs mentioned and even after working through the night there are still issues with the different Microsoft services that offer mail. There is also no indication as to why the problem is happening. Microsoft's recently updated Outlook apps for iOS and Android aren't affected by the problems and an update on the issue is expected imminently.